Description: The NPS has finally approved our proposal. The GLSPS is planning to continue the repairs to some major damage on the SS America that occurred over the last several years. The project is planned for September 7-9, a Friday through Monday, but could be shortened to three days if the workload justifies it. 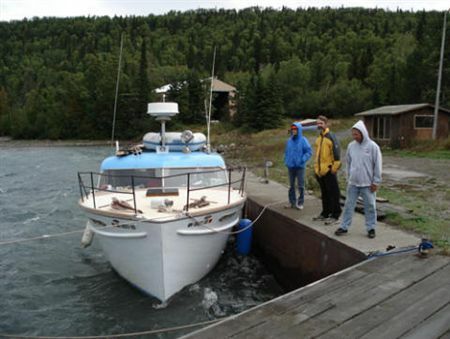 The work will be done using two boats, the Heyboy, and Black Dog. We have room for 10-12 participants depending on whether we can get a shelter to sleep the extra people. Activities: The plan is based on damage noted last year. The starboard upper engine room divider wall is buckling. We would install a 2”x4” header in the wall to straighten and hold it where it was. This is a light weight non-load bearing wall. 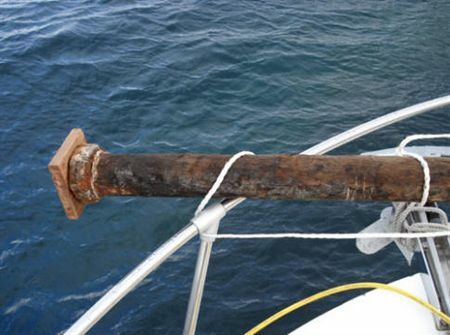 The nuts on the threaded rod came off and the rod pulled through the deck beam on the reinforcement plate we installed on the steel beam arch that supports the pole we added to keep the boat deck from sliding to port. I would like to fix this by replacing the plate and using bolts and locks. Two of the four posts on the open after deck fell down again. We fixed these last project, but apparently didn’t do a good enough job. We set them into the original base fittings but with the deck slope being what it is, I think they just pulled out of the bases. We would add angle brackets to them this time which is a more flexible and stronger approach to doing this. The rounded corner tongue and groove woodwork on the pursers cabin is peeling off and should be re-fastened before is falls off and gets lost in the debris on the deck. The bottom of the divider wall in the crews’ quarters is loose from the base plate. We would add a narrow strip of wood along the base to sandwich the tongue and groove bottoms to the wall base plate. Departure location & date/time: Tentatively Bob Olson's House Thursday Evening Sept 6. Ending location & date/time: Tentatively Bob Olson's Late Sunday Night Sept 9. Current participants: Ken M, Bob O, Ken K.
I apologize for the late listing but the NPS just approved our plan. The work will be done using two boats, the Heyboy and Black Dog. We have room for 12 participants. In an attempt to use the web to do the project sign-ups, I am posting the list of positions and personnel signed up. Members who have work experience will be given preference for the main tasks. Members who have taken the training classes will be given preference for the apprentice positions. Members who applied last year but were turned down for space reasons are on the top of the list. We always try to have 25% new workers. Current First Aid and CPR certification is a strong plus. To sign up email me at kmerryman@glsps.org and let me know what position you would like to be considered for and what your background and training is. 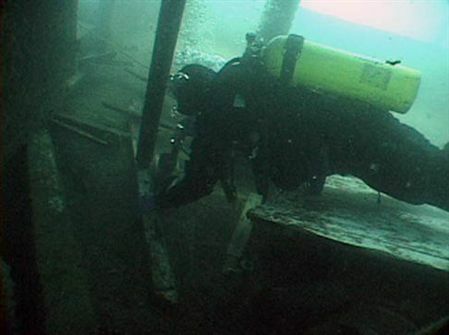 Include in your email your current diving certification level, an estimate of the number of cold water shipwreck dives you have done in the last two years, any GLSPS training classes you have taken, and whether you have a current First Aid and CPR certification. Also let me know if you have any "job skills" in the areas on the job list. Just because there is already a name in the slot does not mean you will not be considered for the position. Many participants can and do fill multiple positions and I will re-arrange people's tasks to fill the needs. Task Manager – On larger projects the project management may be broken up to allow multiple teams to work on different parts of the project. In this case, the task manager directs the operation of the team and schedules dives and makes decisions pertaining to his team. Deck Hand/Gopher – Is the worker who shuttles tanks, equipment, materials etc between the work platform and storage or the machinery area.This position is not necessarily a full time position and is generally a task shared by everyone in his or her off-gassing time. The starboard upper engine room divider wall is buckling. I don’t think this one is being caused by the stress of the cabin deck sliding since the area above this wall is basically open, but it broke above a door where it was weak. I would like to install a 2”x4” header in the wall to straighten and hold it where it was. This is a light weight non-load bearing wall. The bottom of the divider wall in the crews’ quarters is loose from the base plate. I would like to add a narrow strip of wood along the base to sandwich the tongue and groove bottoms to the wall base plate. This year's America Project was again shorter than we like on planning and preparation due to being approved one week before the project, although we have been doing this long enough that we can put together an America Project very quickly now. The two big tasks were to fix the upper engine room starboard side wall and securely install the large spindled support posts on the open after deck. The wall collapsed over the winter of 2005-2006 and the spindled posts fell down again shortly after the quick fix we did on them in the 2004 project. We also buttoned down a loose corner on the purser's office, replaced the steel plate that connects one side of the steel arch near the social salon, and installed a tacking strip on the base of the crew quarters divider wall. 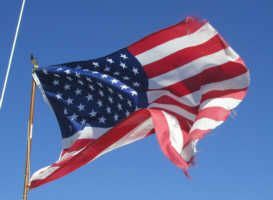 Although seeing the America fall apart is very disappointing and fixes are never as good as new, we had another successful repair project and helped to maintain more of the America structure for many years to come. If it were not for these projects the SS America would be a drastically different looking wreck than it currently is. The work was done using two boats the Black Dog and the Heyboy and eleven participants (front L to R) Paul Imsland, John Connoly, Bill Wallace, Rick Schmidt, (rear L to R) John Ortiz, Phil Kerber, Ken Merryman, Christy Anderson, Brian Anderson, Ken Knutson, and Steve Daniel. Our thanks to all of the participants and a special thanks Brian Anderson for making the Black Dog available, to Kristy Anderson for buying food and doing the cooking, and to Tom Brueshaber for rounding-up and preparing the project materials. The starboard upper engine room divider wall was pulled back into place and a new header with some sister boards were added to give some structural integrity to the wall. The bottom of the steel arch on the starboard side of the ship opposite the social salon was loose because the threaded rod fasteners we added on the last project had come loose. We added a new stronger plate and replaced all bolts with bolts and locks to keep it from happening again. Three of the four posts on the open after deck had fallen down again. We fixed these last project, but apparently didn’t do a good enough job. We were unable to find one of the posts. This time we moved the base of the posts so the posts were perpendicular to the deck as they would have been originally, then shimmed them into place so they actually can bear some of the load of the collapsing boat deck. We also added battens to the beams they supported to insure the beams don't move out of position and the posts don't slip off the beams. Now the posts not only look like they once did, they also give the boat deck three more legs to stand on. The rounded corner tongue and groove woodwork on the pursers cabin is peeling off and was re-fastened using angle brackets to hold it in place to the deck. The wood of the cabin is getting so mushy there isn't much to fasten it to anymore. The bottom tongue and groove paneling of the longitudinal divider wall in the crews’ quarters is loose from the base plate. We added a four inch base board to sandwhich it in place to the 2"x4" base plate. The bottom of the paneling is getting to soft to fasten each board individually. Heyboy pasted on the dock wall in 35 knot winds. 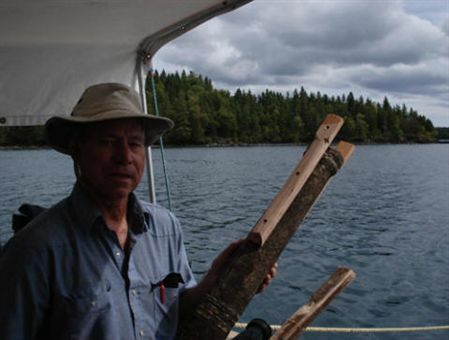 All new wood has to be weighted to make it neutrally buoyant underwater. Phil Kerber checks the buoyancy before sending down the new wall header. 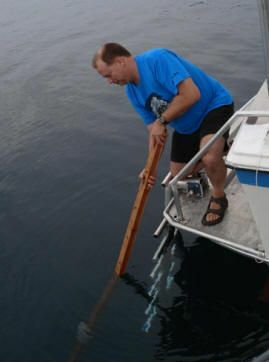 Ken Knutson shows off the cleats added to the afterdeck posts to fasten them to the supporting beams. We added a block to the base of the posts to shim them to the proper length. 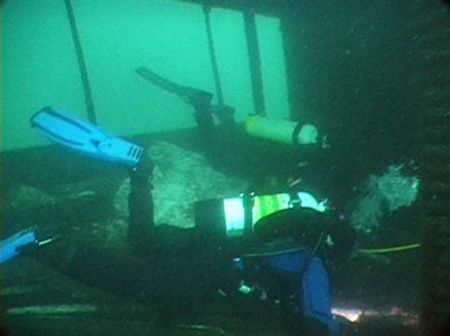 Divers measure support post base location on open afterdeck. 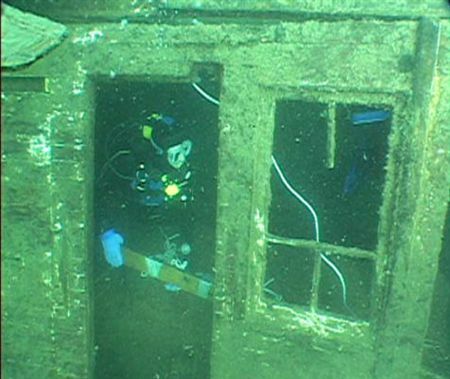 GLSPS diver fastens support post base to open afterdeck. Rick Schmidt positions beam to support engine room wall in preparation to pull it into place. Bill Wallace made an amazing find in the wreckage of the assistant engineers quarters--an intact globe from a wall sconce. 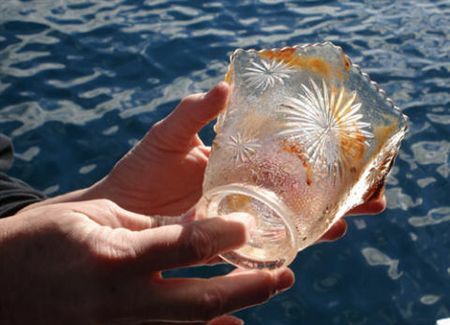 The artifact was recovered and given to the park. 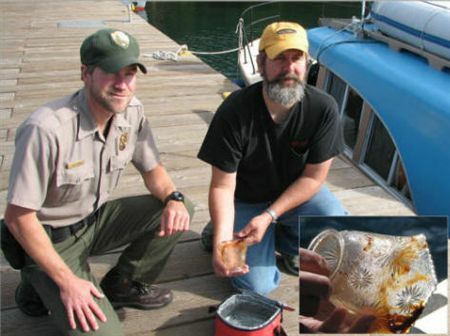 GLSPS will work with the park to conserve the artifact for the Windigo Visitor Center shipwreck display. The intact artifact gives us a better idea of what the furnishings of the America were really like. 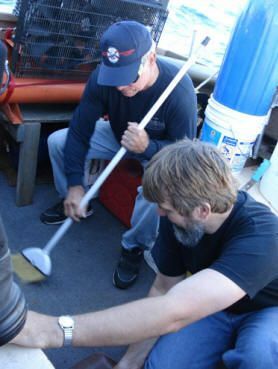 Ken Knutson and Bill Wallace on clean-up duty on the back deck of the Heyboy as we cruise back to Grand Portage after a successful project.